Montréal, 2016-Dec-16 — /Travel PR News/ — Bombardier Commercial Aircraft today congratulated launch operator airBaltic on the superb execution of the CS300 aircraft’s first commercial flight. With 120 passengers aboard, including local media, the flight departed Riga and landed in Amsterdam. 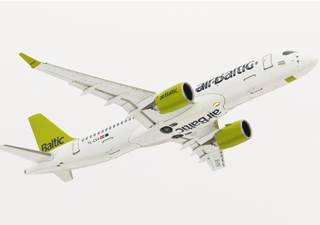 airBaltic is operating the CS300 aircraft in a 145-seat, two-class configuration. The airline has ordered a total of 20 CS300 aircraft. Since entering revenue service with SWISS, the CS100 aircraft has completed more than 1,600 flights — carrying over 156,560 passengers, covering over 1,181 500 km and serving 18 destinations. The C Series is the only aircraft optimized for the 100- to 150-seat market segment, which drives the aircraft’s phenomenal economic proposition and performance, opening up new opportunities for single-aisle aircraft operation. The C Series aircraft is manufactured by the C Series Aircraft Limited Partnership, an affiliate of the Bombardier Commercial Aircraft segment of Bombardier Inc.
Bombardier has created a new standard in cabin design and flexibility to ensure an unrivalled passenger experience. The aircraft’s larger seats, overhead bins and windows deliver a wide body feel that offers passengers unparalleled comfort in a single-aisle cabin. The CS100 and the CS300 aircraft have over 99 per cent parts commonality as well as Same Type Rating. The groundbreaking Pratt & Whitney PurePower® PW1500G engine, combined with the aircraft’s advanced aerodynamics, delivers reduced fuel burn, noise, and emissions – making the C Series the most community-friendly aircraft. Established in 1995, airBaltic (AIR BALTIC CORPORATION) is the world’s most punctual airline connecting the Baltic region with 60 destinations in Europe, the Middle East, and the CIS. airBaltic is a joint stock company that was established in 1995. Its primary shareholder is the Latvian state. The airBaltic fleet consists of 25 aircraft – 12 Boeing 737, 12 Bombardier Q400 and one CS300 aircraft. Another 19 CS300 aircraft are on order. airBaltic has received numerous international awards for excellence, innovative services, and achievements in reshaping its business. In 2012, airBaltic was ranked by Airlinetrends among the Top 10 airlines globally for innovations. airBaltic achieved the best on-time performance globally for two years running in 2014 and 2015. This entry was posted in Airlines, Business, Travel, Travel Services and tagged airBaltic, Bombardier, CS300 aircraft, Fred Cromer, Martin Gauss, Rob Dewar. Bookmark the permalink.